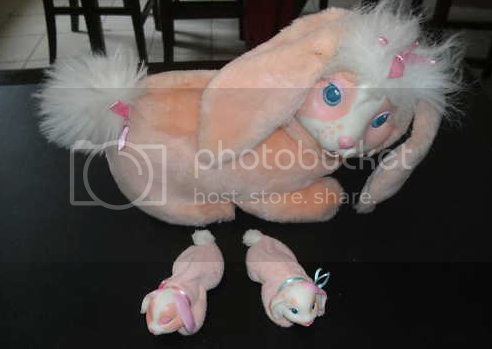 I won an auction on ebay for a bunny surprise for only 9.99! with everything its 19 dollars! awesome.. The only Surprise friend I don't have any examples of is Bunny Surprise. I don't have mommy ponies or teddies, but I do have babies. That was a great find, congrats! Congrats!! I had that same Bunny Surprise as a kid, though I think mine had three babies. I LOVED the Surprise pets...I had the puppy, kitty, bunny, bear, and pony. They were so stinkin' cute! Didn't they do turtles too? One of my cousins had a turtle with babies you could take out and put back in to its belly. Did you know JUST PLAY TOYS is bringing PUPPY and KITTY Surprise back for holiday 2014??? I wonder if they sell well, if they will remake the HORSE, BUNNY and other animals! ?